I played my first game of ACQUIRE in 1979. I spent most of the game without any money and had very little involvement in what was happening during the game. I walked away from that experience believing that the game was not very fun. Games are meant to be fun. I loved the overall concept of the game, but I didn't like how a player could be left out of the game while still having to take turns. I decided to give the game another chance. I made two significant rule changes and then defined some gray areas. This allowed all players to stay involved in the game and helped to keep the outcome undecided until the end of the game. These changes became known as "Lloyd's Rules of ACQUIRE" and allowed me to fall in love with the game. Along with my siblings, we developed a group of friends who also loved the game of ACQUIRE. We endlessly played intense matches and many times ended up playing a second round in the same sitting. It was on those days we wished we had a double-size game of ACQUIRE with more companies. We tried putting two boards together, but this created a duplication of tiles and had the effect of two different games instead of one big game. It also only increased amounts of stock available in a company but didn't increase the amount of companies. I contacted Avalon Hill in the mid 80's to try and convince them to make an expanded game, but they were not interested. They felt that the game had not gathered enough attention to demand another version. I was highly disappointed, but did not have the means or knowledge to attempt the project myself. I knew that if I was to do the project, then I would only be satisfied with a plastic board. When Hasbro came out with the 1999 version, we were able to put the 1999 board next to the old yellow board from the earlier editions. While this now gave us more companies to choose from, it still had the feeling of two separate games. The difference in the size of tiles caused the issue of how we drew tiles and it also limited the players to play the respective tile on the respective board. 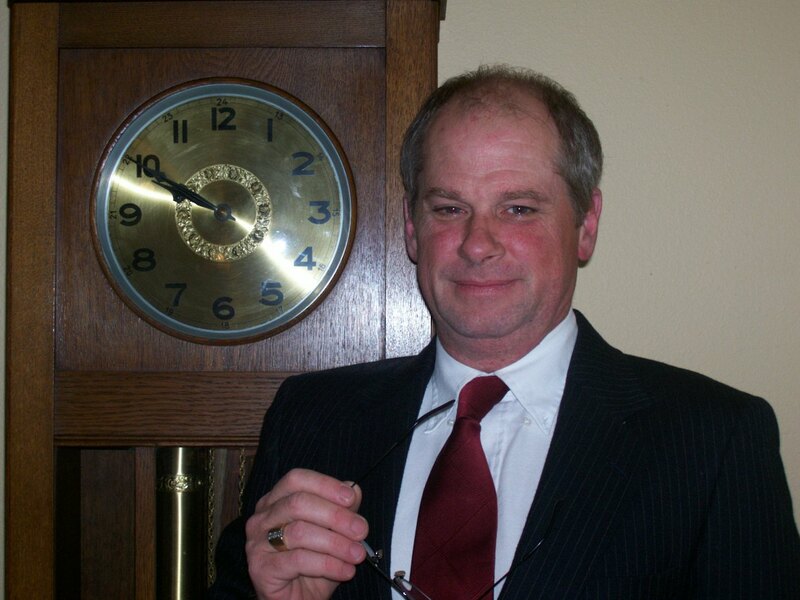 At the same time the companies were limited to their respective board. 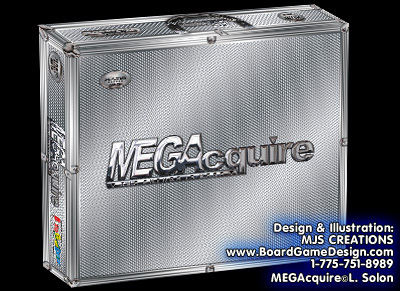 I contacted Hasbro in 2006 to try and convince them to adopt Lloyd's Rules as a variant to the game of ACQUIRE and to consider expansion of the game. By that time, they had given the rights for the Avalon Hill line of games to their subsidiary, Wizards of the Coast (WOC). I hired an agent to try and promote my ideas to WOC, but there was no interest in paying a second inventor for ideas on a single game. 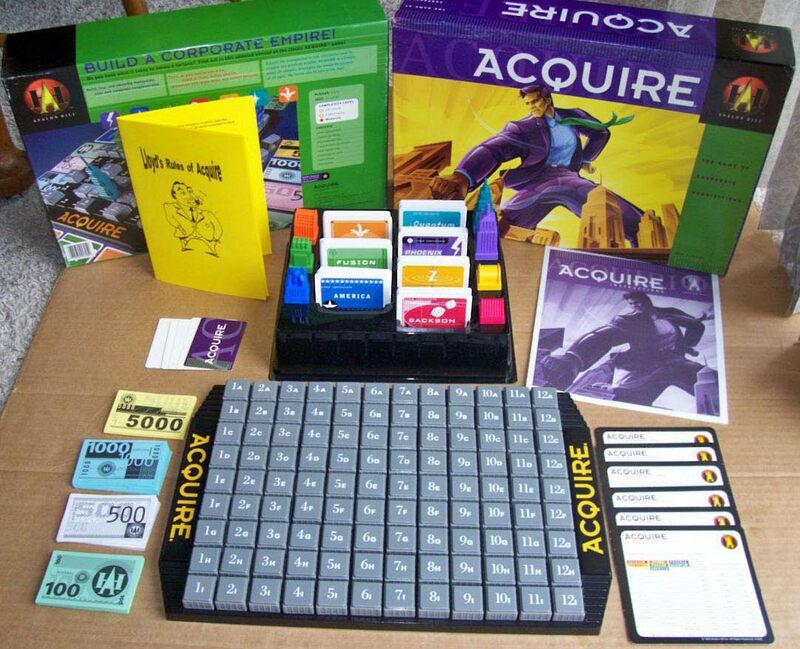 WOC went on to produce a very disappointing cardboard version of ACQUIRE in 2008. I contacted Hasbro because my older sister urged me to make "Lloyd's Rules of ACQUIRE" available to other players who may be interested. I decided to write them down and publish them in a nice rule booklet. This process began to open a whole new world for me into the game of ACQUIRE. I have learned an immense amount of information about the History of ACQUIRE that for over 25 years I had no clue existed. 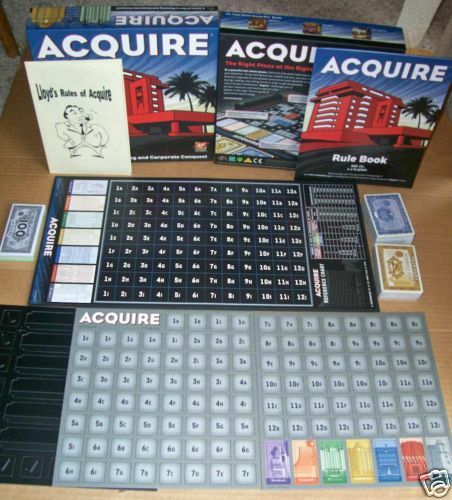 I was amazed to find that the original concept of the game of ACQUIRE was played with different amounts of stock for each hotel and that some stocks were randomly given to each player at the beginning of the game. I had to wonder why they ever changed the concept. I also began to notice that many people needed help fixing old games. It is easy to lose tiles or stock certificates and with no supply available anywhere these losses would make the game difficult to play. I decided to start breaking apart incomplete games and making parts available for those who needed to fix their games. This has allowed me to converse with a large amount of ACQUIRE enthusiasts all over the world and I am amazed at how much of a desire there is for anything new that can be found in the game of ACQUIRE. My brother wrote me a letter in early 2010 asking me why I never developed the larger game idea that he liked so much. I told him that trying to make the game right would cost a lot of money and as an independent creator, I would have trouble finding a company to take on this project. Due to some recent changes in my life when I received my brothers letter, I began to think that time is going by too quickly and I shouldn't admit defeat so easily. It was time to make the project a reality. The advancement of computer technology since the 80's allowed me to actually create basic concepts and artwork for the game of MEGAcquire. I was able to make a cardboard prototype of the game. Of course, this only reinforced my knowledge that this game would only be good if the board was made of plastic. There were different struggles in creating this game such as how many tiles to have in the players hand, how many stocks to purchase on a turn, and whether there should be a time limit set on a player's turn because of the increased amounts of possible choices. MEGAcquire can become a lengthy game so I decided to add the possibility of pre-set time limits. Since the concept of winning is based on the person with the most money, then the game can end at any time limit designated by the players. With the availability of the worldwide web, I was able to locate Michael & Lisa Spahitz of Board Game Manufacturing in Pahrump, Nevada. I sent them my ideas and they took on my project. My wife and I went to Pahrump in May of 2010 to meet Michael & Lisa and have some in depth discussions of the concept and their abilities. It was at that time that Michael suggested that the tiles did not have to be square and could perhaps be hexagon. When I came back home I started playing with the hexagon idea and liked the fact that any connection could create a company. This would also allow the companies to grow diagonally across the board, so I decided to make the change. Making the metal mold that would create this extravagant board was the problem. Envision a waffle, the board is a waffle. Now envision the waffle iron and how much larger it is than the waffle. It was difficult to find a factory that would make this project when I am only able to commit to making 500 games. Most factories want to produce a minimum of 5,000 games. But with the help of Michael & Lisa we have been able to produce a board that will fully satisfy the expectations of the customer. I am doing this project for myself, my siblings, and my old intense ACQUIRE buddies from days gone past. I want to play a larger game of ACQUIRE that is top quality before MY days have gone past. I have had enough interest in this project that I will make this game available to anyone who has the desire to play a larger game of ACQUIRE. 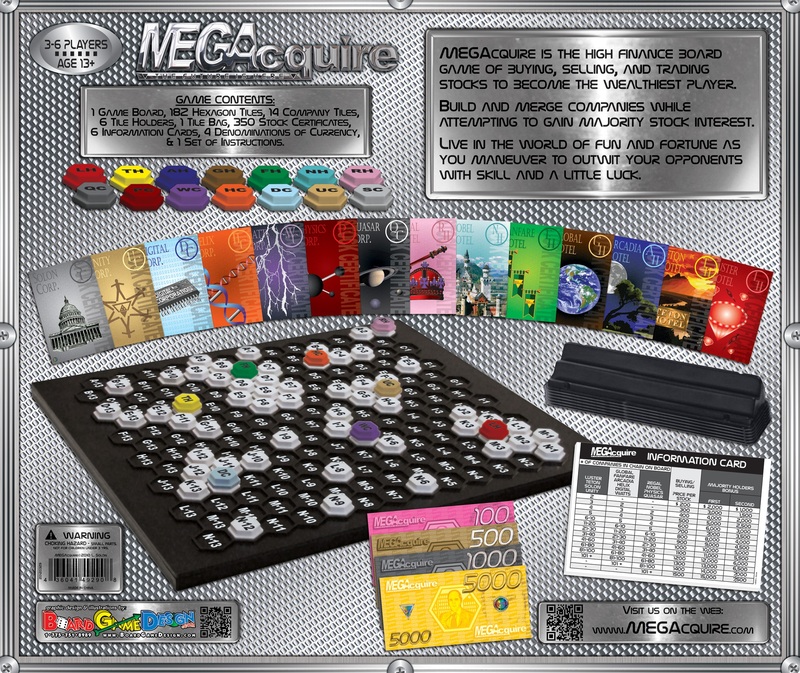 I present to you MEGAcquire — my attempt to take the love I have for the game of ACQUIRE and pass it on to all who may be waiting for the next level of challenge from this historic game.